← What? Teen Criminalizes AND Victimizes Herself with Selfie? In the swift decline and fall of Rafael Nadal, this was the worst. Last year he was Number One in the world. Last night he was just numb. In his third-round U.S. Open match with Fabio Fognini, who’s long been a guaranteed first ballot entry into the Douchebag Hall of Fame, Nadal led 6-3, 6-4, 3-1. But when Fognini broke back to 3-3, you could tell that the Italian really believed he could come back from two sets down and beat Nadal, something no one else has ever done. And you could tell the Spaniard believed it too. All you need to know in the end is this: Fognini (described elsewhere as “hardly known for mental fortitude”) had 70 winners and 58 unforced errors; Nadal 30 and 18. 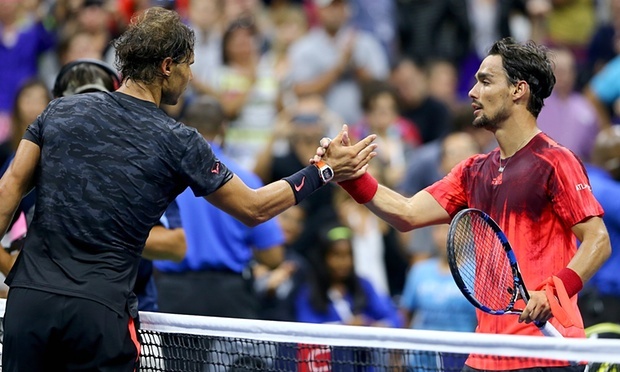 As one news report had it, Nadal didn’t lose the match – Fognini won it. Regardless, It was surpassing sad to watch, which the hardflinching staff did until 1:30 am. Hard to see how Nadal comes back from this loss. “He’s a player with a great talent, with huge shots, and he played amazing shots,” Nadal said afterward. “But what I am doing worse is playing worse than what I used to do the last couple of years. That’s it. “Is another loss,” [Nadal] said. “Not tougher. As I tell, you know, my mind allows me to fight until the end. Is something that I was missing for a while, that feeling that I am there. No doubt he will. Just not sure we can stand to watch it. This entry was posted in Uncategorized and tagged Douchebag Hall of Fame, Fabio Fognini, Rafael Nadal, The Guardian, U.S.Open. Bookmark the permalink.